Ivan Illich’s In the Vineyard of the Text is an exploration of the evolution of reading and the book in Western Europe during the 13th century. 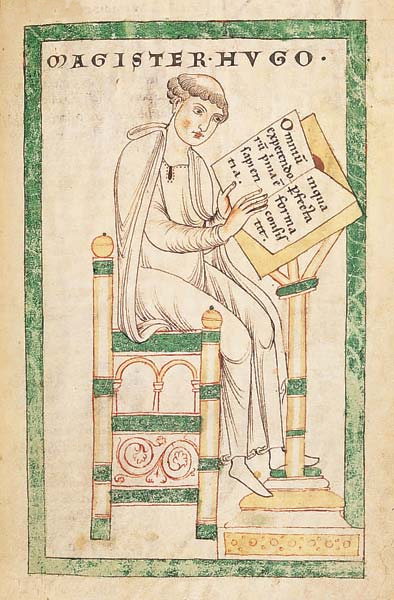 It is focused on Hugh of St. Victor and a well-known work of his titled the Didascalicon, essentially the first guide to the art of reading. Illich early on acknowledges his debt to Walter Ong who synthesized a great deal of research on the cultural consequences of the shift from orality to literacy (and later to what Ong called the secondary orality of electronic media). What is sometimes lost in this schema is the persistence of orality after the emergence of literacy. And not only in the sense that oral cultures existed alongside literate ones, but also in the persistence of orality within literate societies. A full 1500 years after literacy was effectively internalized into Western society (which is not the same thing as saying that all of those living in Western society were literate), reading remained a fundamentally oral activity. The quotation from Illich above is drawn from a chapter titled, “Recorded Speech to Record of Thought.” That title nicely captures the degree to which writing was understood as a record of oral communication rather than its own distinct medium prior to the period Illich examined. The emergence of telephony, radio, and television marked the re-emergence of orality following the era of print literacy’s dominance. Ong called this secondary orality. Having appeared after literacy, it was not identical to primary orality, but it nonetheless represented a reemergence of orality and its habits which would now compete with literacy on the cultural stage. Within the last twenty years, however, a funny thing has happened on the way to the world of secondary orality. Writing or text has reasserted itself. Text messaging, emails, online reading, e-reading, etc. — all of these together mean that most of us are deciphering of a lot of text each day. Even our television screens, depending on what we are watching, may be chock full of text, scrolling or otherwise. But this reemergence of text is marked by orality, as the observation by Hitchings suggests. Can we call this secondary literacy? Is it still useful to speak in terms of literacy and orality? It has always seemed to me that the orality/literacy distinction got at important historical developments in communication and consciousness. The bare dichotomy glossed over a good deal and it was always in need of qualification, but it was serviceable nonetheless. Secondary orality also pointed to important developments. But now what we appear to have, text having reasserted itself, is a thoroughly blended media environment. It’s chief characteristic is neither its orality nor its literacy. Rather, it is the preponderance of both together — overlapping, interpenetrating, jostling, complementing, conflating. Interestingly, there has also been, of course, a reemergence of social literacy, but it is not tied to the oral as it was in the circumstances described by Illich above. Rather than an orally constituted literate social anchored to physical presence, we have a diffused literacy based, image-inflected social often untethered from physical presence. A social space was, then, constituted by an oral performance of the written text and gathered presences. We have, today, spaces constituted as social by silent reading and the presence of absences.